FP Cleaner with Expression® and SharePoint Designer® support. FrontPage® versions covered: 2000, 2002 and 2003. 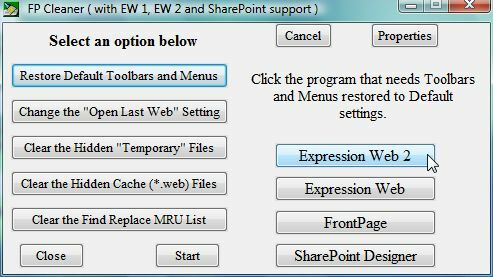 Other programs covered: Expression Web® and SharePoint Designer®. Checks for the location of the folder containing the CmdUI.PRF file, which is the file that contains a pointer to the Toolbar and Menu settings. If this file is corrupt, it can keep the program from opening or cause it to open and freeze. Deleting this file forces creation a new one when either program is reopened. Note: You may have to reinstall addins after deleting this file. when trying to open / save / edit pages on your web site. Deleting them "usually" solves the problem. Displays Cancel when the right panel is displaying program buttons. Clicking Cancel removes the program buttons and resets the information panel. or one for each if installed, on the right side of the FP Cleaner panel. Clicking a button will start that program and close FP Cleaner. FP Cleaner closes without starting a program. Note: All files are sent to the recycle bin. Norton firewall alert about internet access. Download in a zip file and run from the Desktop Download File size 20.0 KB. Download as an exe file and run from the desktop: Download File size 80.0 KB. The installer will add it to Add/Remove programs so it can be easily uninstalled. and place a link in the Start Menu Programs listing. The install version will eliminate the "Trust this software" warning pop up in Windows XP SP2.